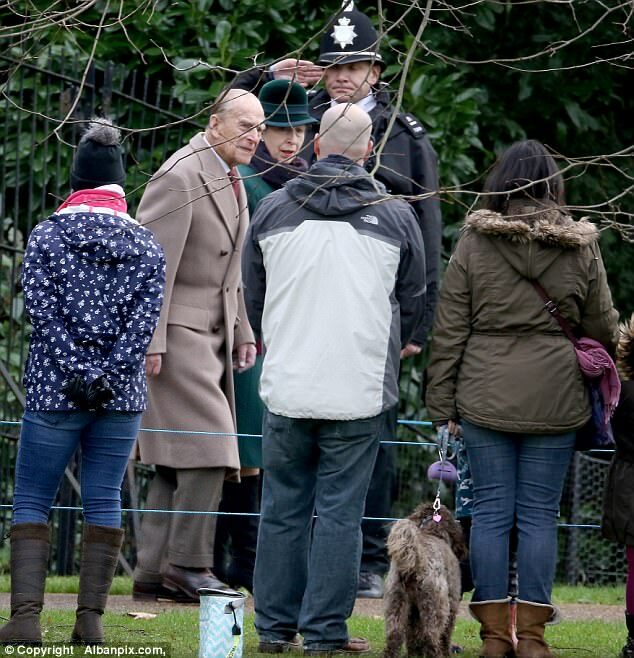 The Duke of Edinburgh is said to have cracked the edgy joke as he led a procession of royals and guests on a walk to the morning service at St Mary Magdalene church. 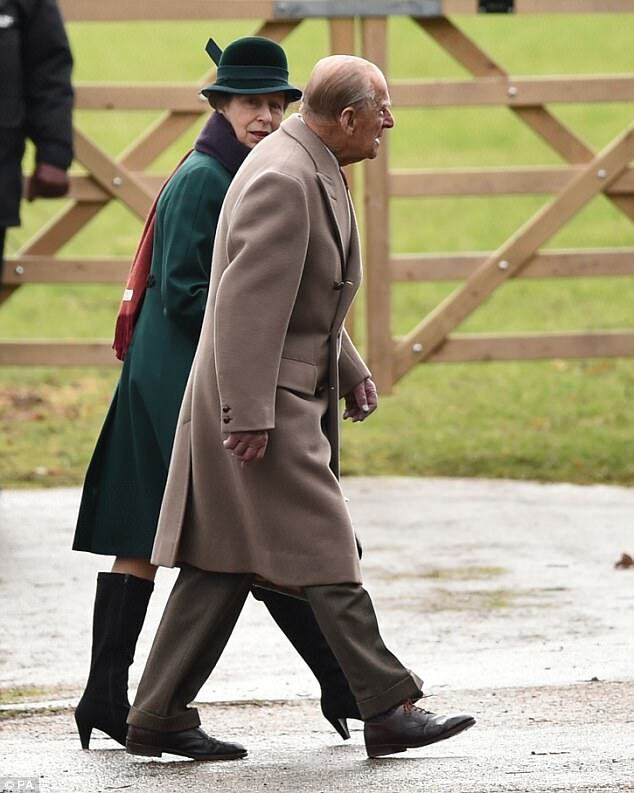 The 96-year-old, who retired from royal duties earlier this year, was said to be chatting to Princess Anne when he spotted a tall man sporting a long ginger beard. An onlooker in the crowd said: 'Philip was wishing lots of people a Happy New Year and then he spotted this guy with his distinctive beard. 'He pointed at him in a funny way and turned to one of his Royal bodyguards, saying: "Is that a terrorist?". 'He was obviously having a little joke, but he said it within earshot of the man who burst out laughing and appeared to find the whole thing hilarious. 'I think Philip knew he was going to be overheard. I'm sure Philip didn't mean any harm. The bearded man left Sandringham before he could be identified. 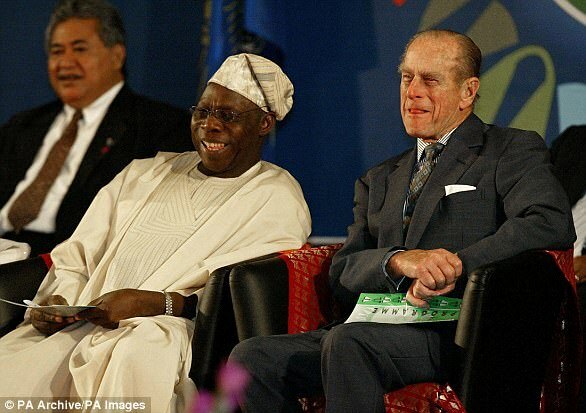 Prince Philip, who completed more than 22,000 solo engagement since 1952, has courted controversy through risque jokes on several occasions. Philip walked to the church beside, Anne who was wearing a green coat and red scarf. 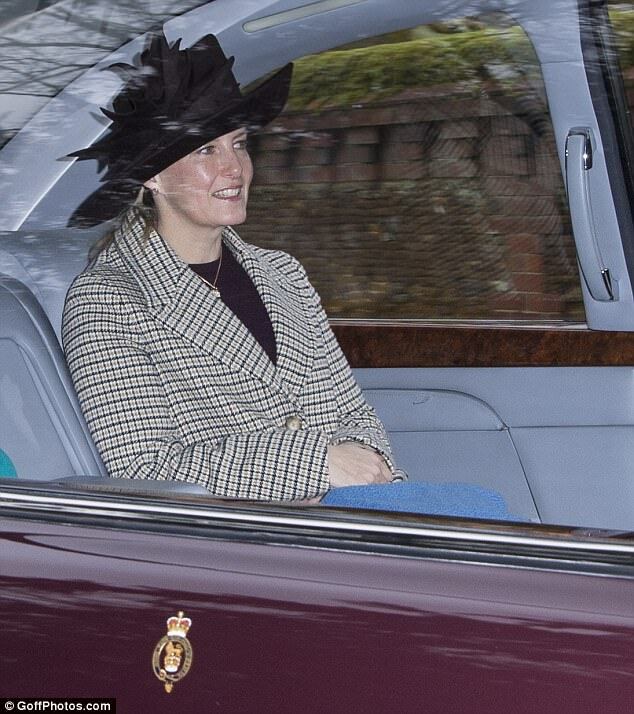 The air were followed behind by Anne's husband Sir Timothy Laurence, Prince Edward and his 14-year-old daughter Lady Louise, and other guests staying at Sandringham House. 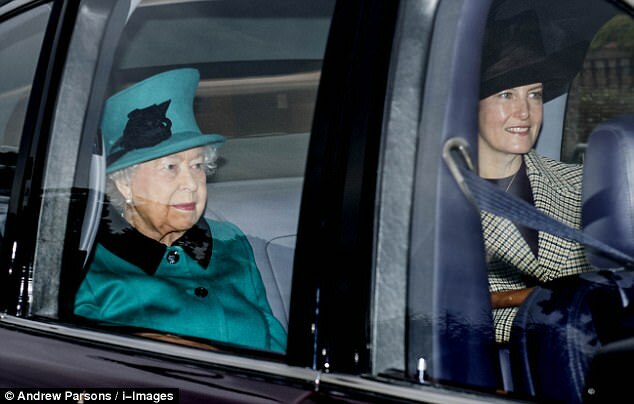 The 91-year-old Queen, who was wearing a teal coloured coat with a black collar and matching hat, was driven to the church with Sophie Countess of Wessex in her maroon-coloured Bentley. 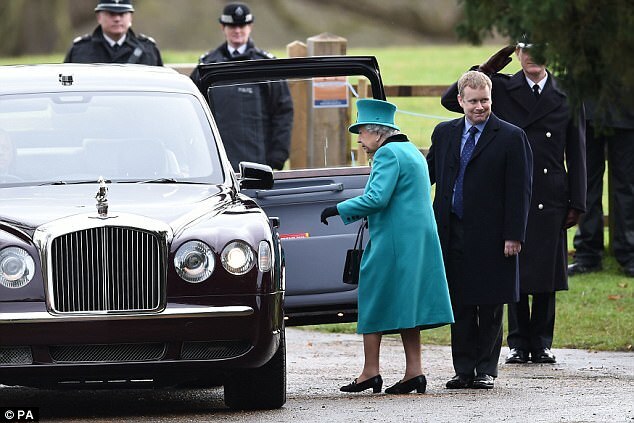 She smiled as she emerged from the car and waved twice at the 600-strong crowd before walking up the steps into the 16th century church. There was no sign of the Duke or Duchess of Cambridge or Prince Harry and his American actress fiancée Meghan Markle. During his walk to the service, Philip also joked with Alison Leggett, 54, of Hunstanton in Norfolk, after seeing her Labrador as he laid on the wet ground. 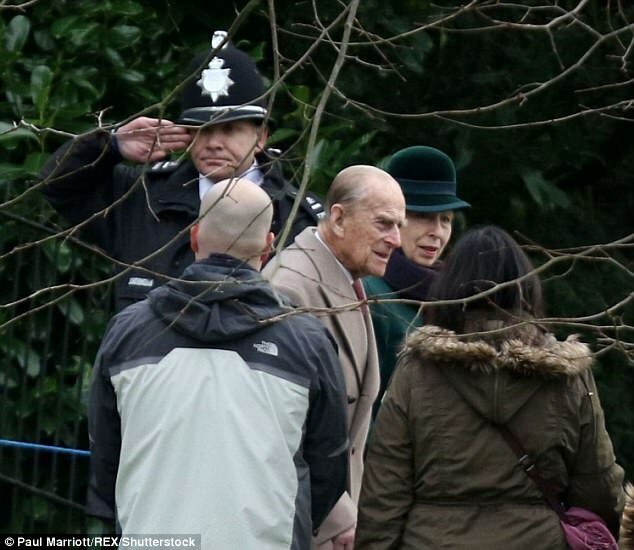 Philip seemed in a more politically correct mood and avoided saying anything controversial as he walked back to Sandringham House while chatting once again to Princess Anne and wishing several members of the crowd a Happy New Year. But once again his attention was drawn to a dog in the shape of a large rare breed Black Russian Terrier called Boris, owned by Neil Richards, 55, and wife Debbie, 54, of Market Rasen, Lincolnshire. Mr Richards said: 'Boris is an unusual dog and quite big. Philip asked what breed he was and when my wife said he was a Black Russian Terrier, he looked surprised and joked "A terrier?" 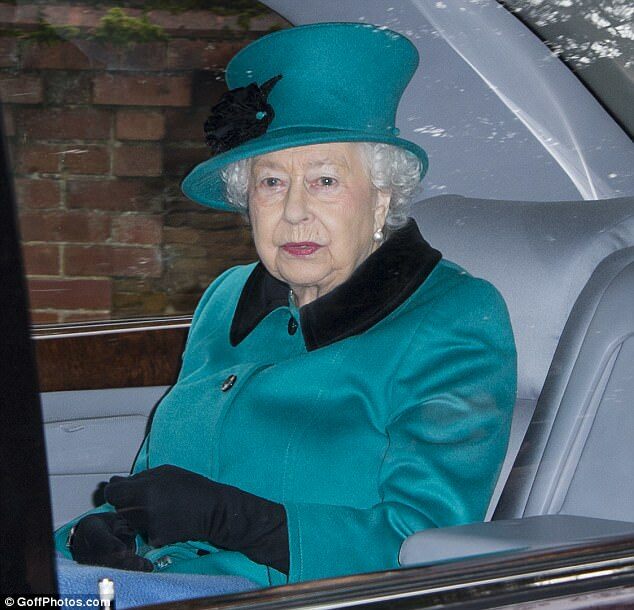 Buckingham Palace refused to comment on the alleged joke by Prince Philip when approached by MailOnline. ‘I declare this thing open, whatever it is.’ During a visit to Canada in 1969. ‘It looks like a tart’s bedroom,’ — on seeing plans for the Duke and Duchess of York’s house at Sunninghill Park in 1988. ‘You can’t have been here that long, you haven’t got a pot belly’ — to a Briton in Budapest, Hungary, in 1993. ‘Aren’t most of you descended from pirates?’ — to a resident of the Cayman Islands in 1994. ‘You managed not to get eaten, then?’ — to a student who had been trekking in Papua New Guinea in 1998. ‘I wish he’d turn the microphone off’ — muttered at the Royal Variety Performance as he watched Sir Elton John perform, 2001. ‘You look like a suicide bomber,’ to a young female officer wearing a bullet-proof vest on Stornoway, Isle of Lewis, in 2002. ‘Children go to school because their parents don’t want them in the house’ — prompting giggles from Malala Yousafzai, who survived an assassination attempt by the Taliban after campaigning for the right of girls to go to school without fear — October 2013. At a reception to honour Australians, Philip met the husband of Gill Hicks, who lost her legs in the July 2005 London bombings. 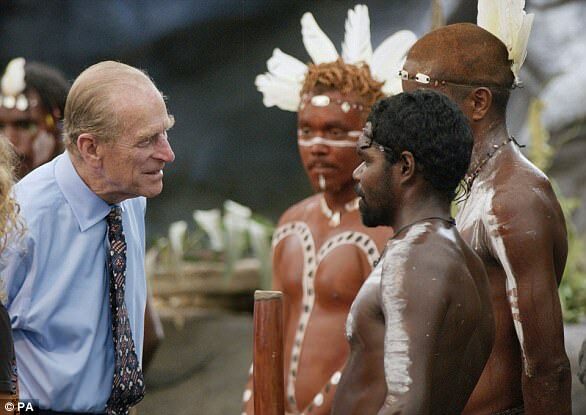 ‘You’re not Australian!’ said Philip. ‘No, actually I’m not important, I’m just here because of my wife,’ he said. ‘Tell me about it!’ said the Prince. At a Buckingham Palace dinner in 2011 Philip listened to tenor Russell Watson’s stirring rendition of Jerusalem. ‘Are you responsible for making people overweight in Crawley?’ — to the manager of a cake shop on a 2006 visit to the town. For a 2016 programme about the 60th anniversary of the Duke of Edinburgh’s Award scheme, presenter Phillip Schofield performed a wing walk. At a Buckingham Palace reception to thank those involved in the Diamond Jubilee celebrations in 2012, Prince Philip met Conservative Health Secretary Jeremy Hunt. ‘Who are you?’ he asked. Hunt explained he was Health Secretary but that he’d been Culture Secretary during the Jubilee and Olympics. 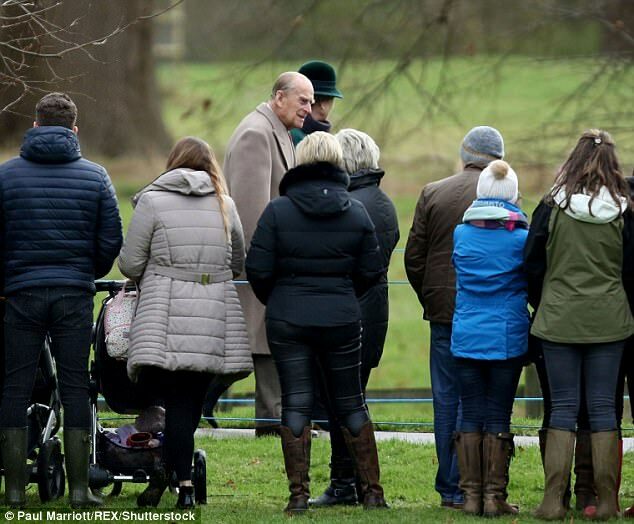 ‘Well they do move you people on a lot,’ said Philip, walking off. On a visit to the GCHQ building in Cheltenham in 2004, Labour MP Chris Mullin asked Philip about the modern design, saying: ‘Would Charles approve?’ ‘Charles who?’ replied the Duke. Extracted from Prince Philip: Wise Words And Golden Gaffes by Phil Dampier and Ashley Roberts, published by Barzipan Publishing at £8.95.